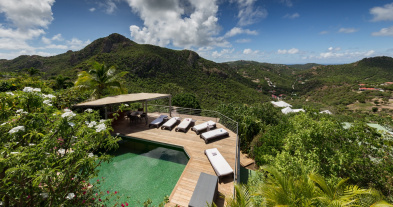 Located on the heights of Lorient, Villa SUCRIER is a simple, comfortable, intimate and welcoming villa. 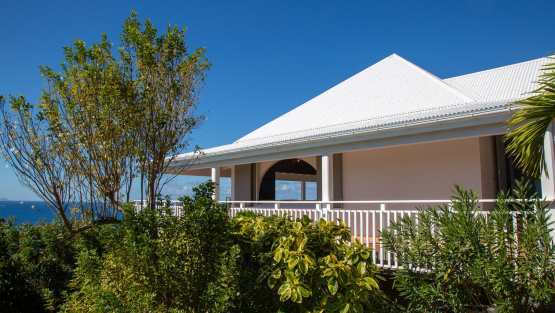 Ideal for a small family or a couple, it offers you a haven of peace with a breathtaking view. 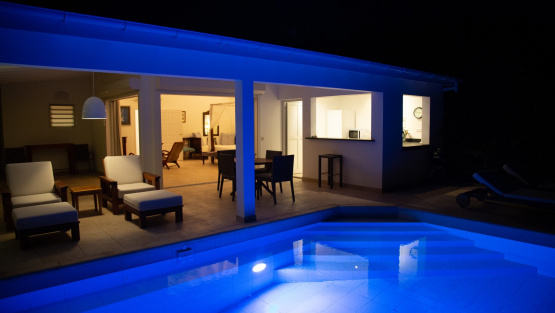 Villa SUCRIER, is a contemporary 2 bedroom villa located in Lorient a few minutes from the beach and shops. 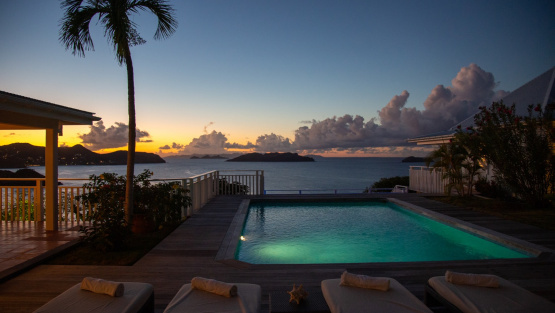 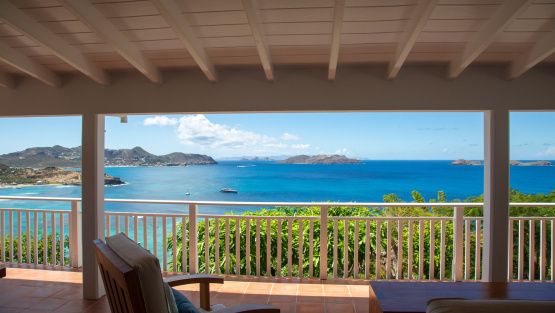 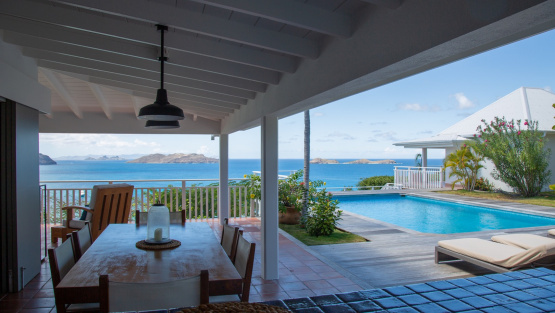 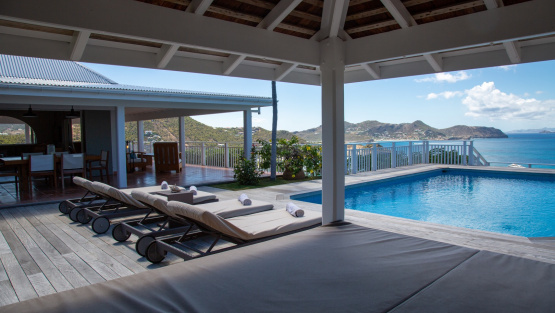 This villa offers a spectacular view of the bay. 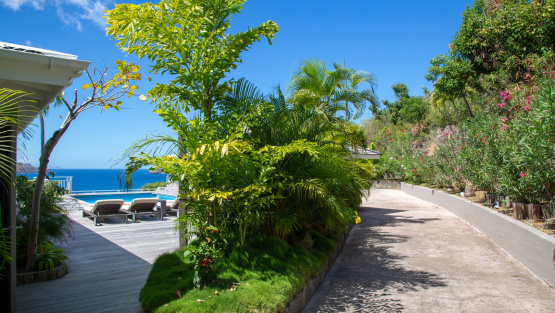 Surrounded by a garden of hibiscus, cactus and flamboyant trees, Villa SUCRIER is the place to enjoy a real tropical getaway. 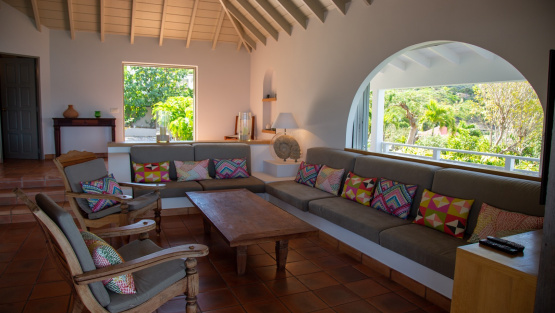 The colourful exterior and magnificent ocean view are balanced by a soothing interior decor in rattan, dark wood and smooth terracotta. 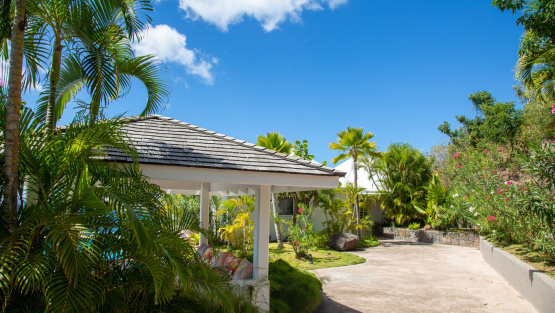 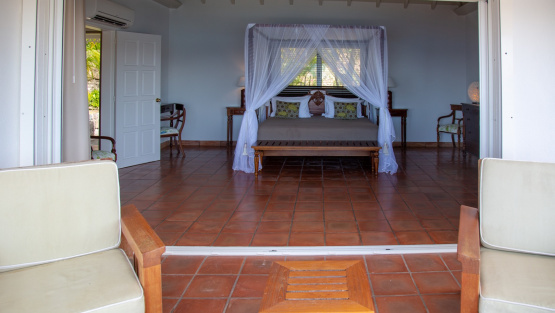 The 2 large bedrooms are located in a separate bungalow. 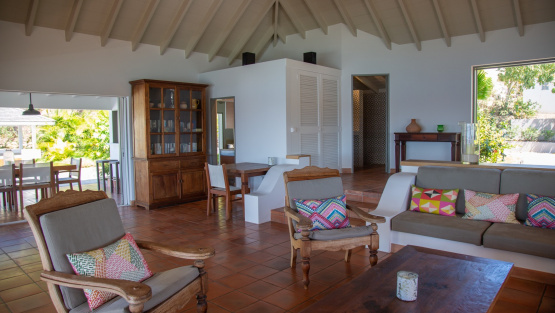 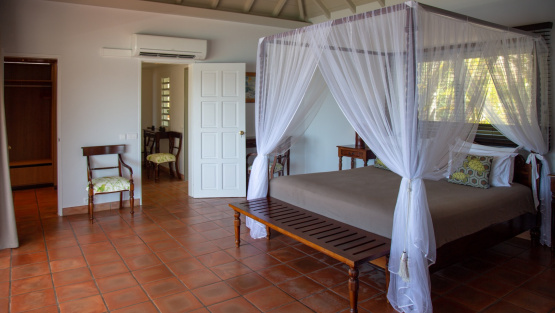 Each room has a double bed, ceiling fans, air conditioning and access to the terrace. 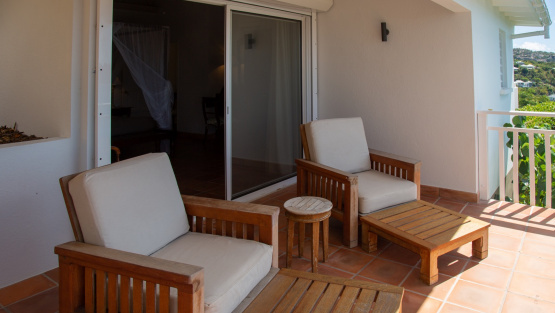 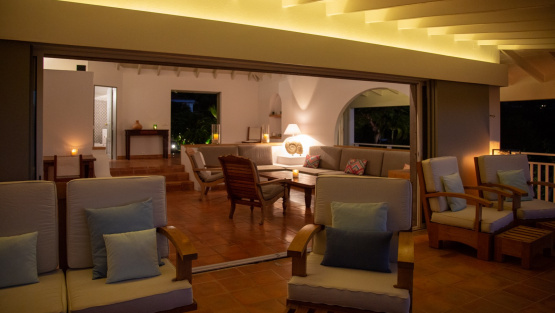 The spacious lounge has sliding glass doors that open onto the front and side terraces. 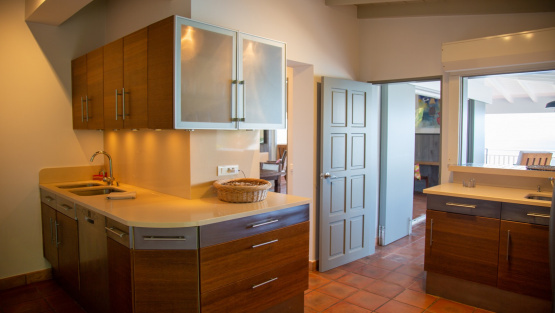 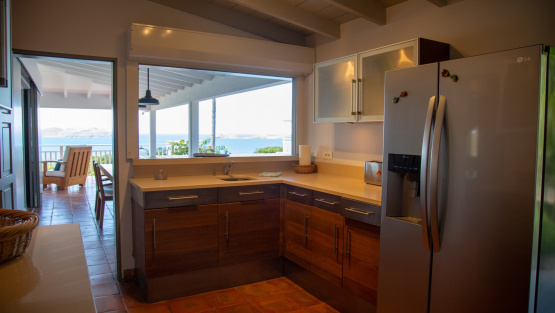 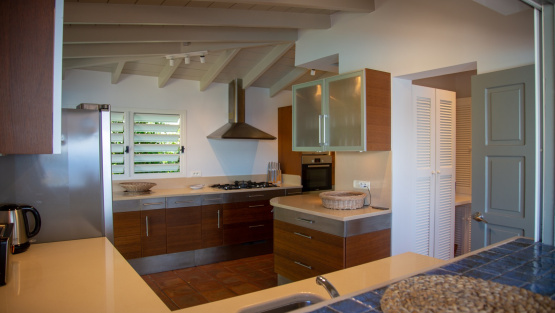 The well-equipped kitchen opens onto the dining room and living room. 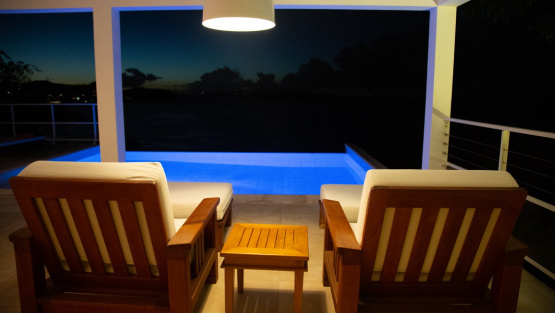 A large terrace surrounds the pool, which offers a view of the ocean. 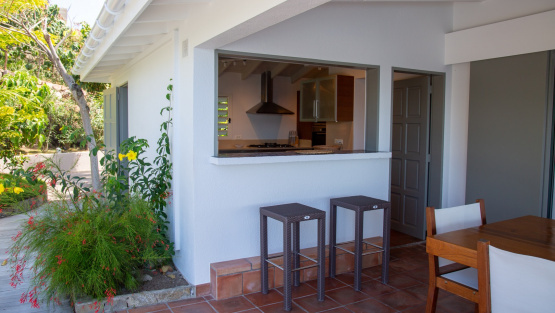 The house also has WiFi, voltage converters and a gas grill. 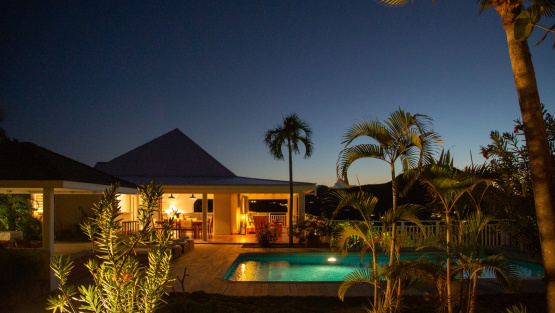 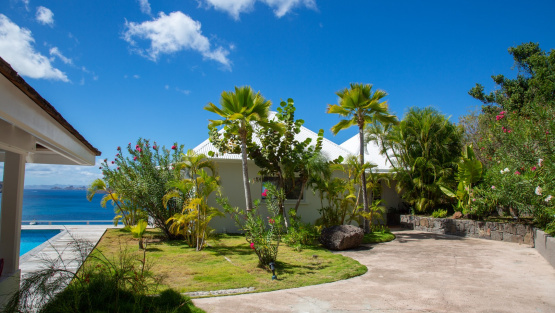 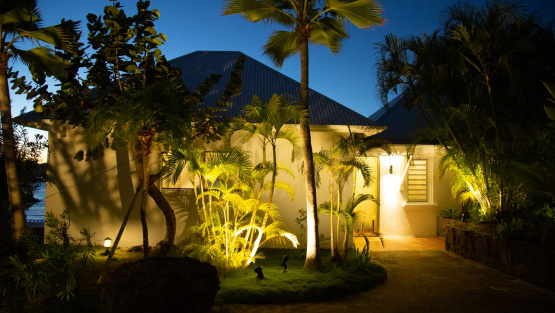 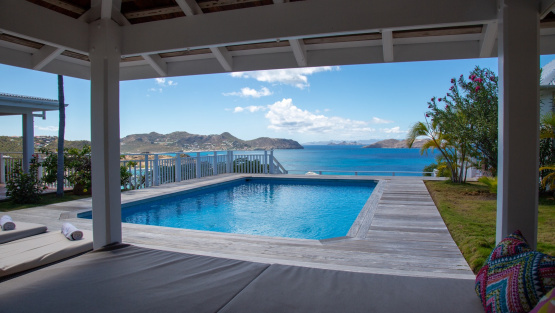 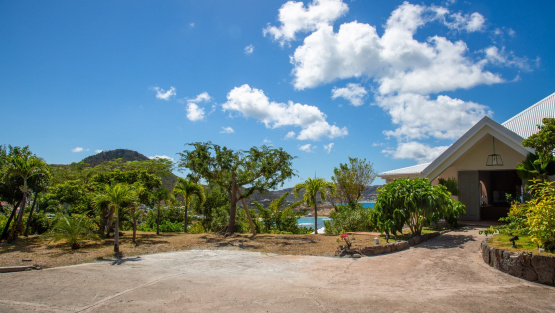 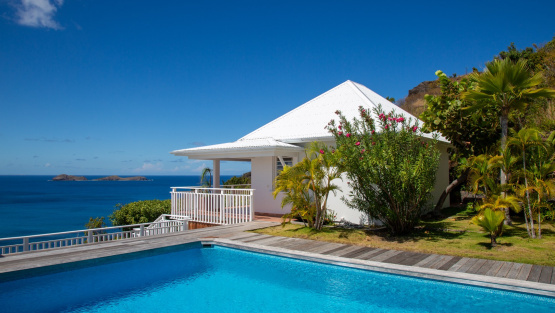 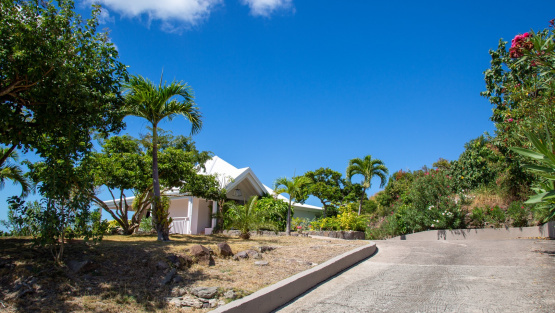 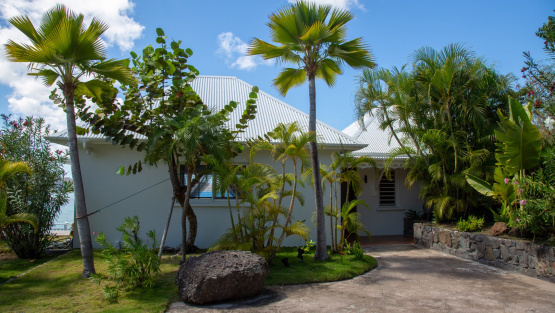 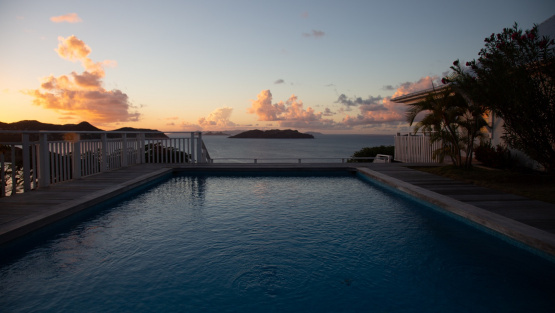 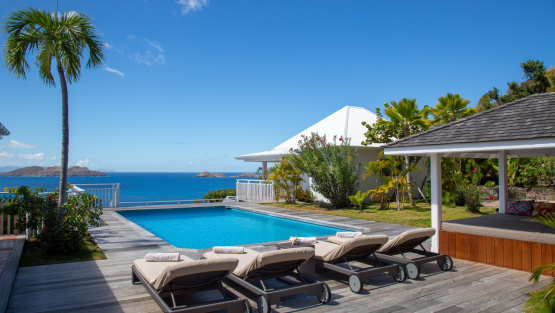 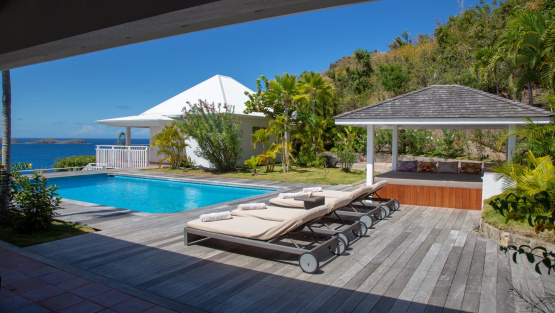 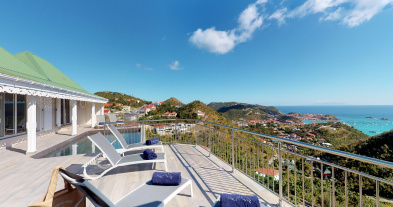 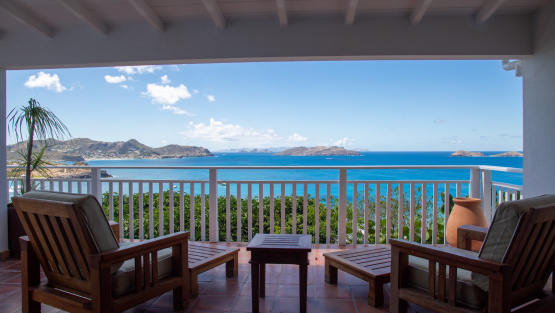 This villa is wheelchair accessible and can be rented with its twin villa, TORTUE, for a total of 3 bedrooms. 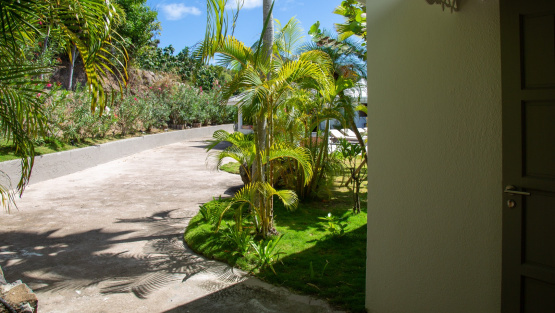 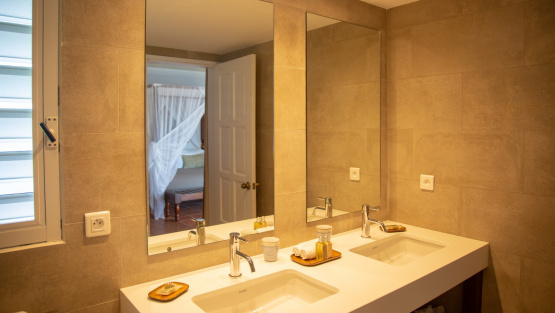 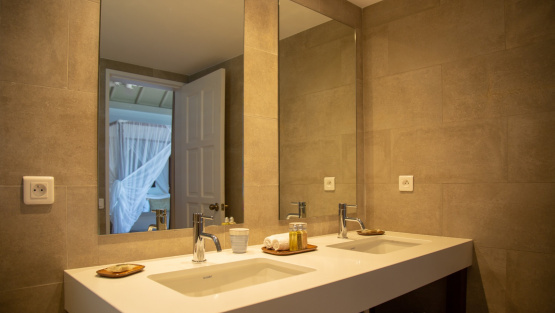 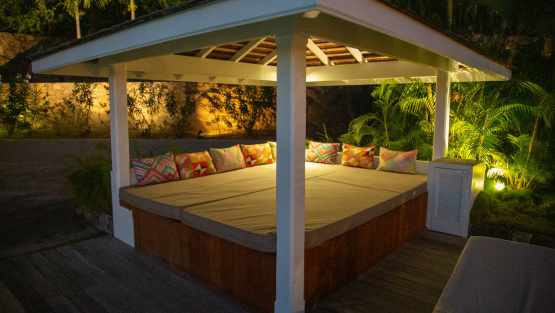 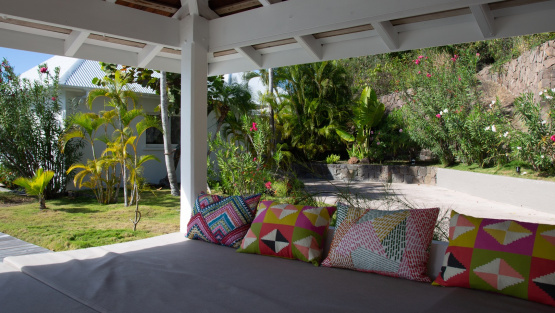 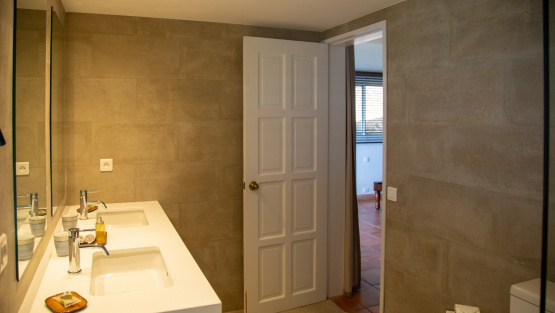 When rented separately, the two villas retain total privacy. 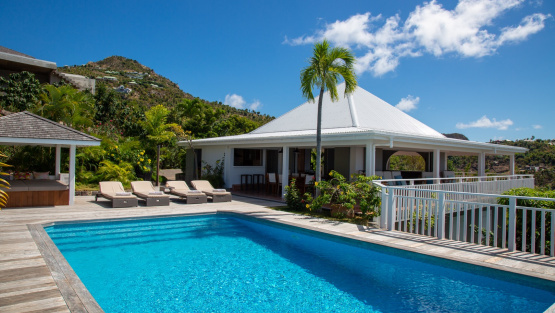 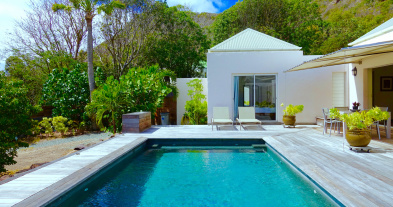 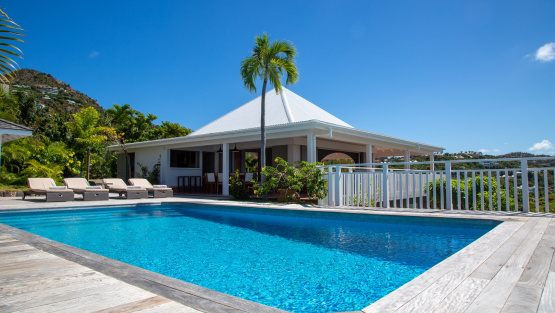 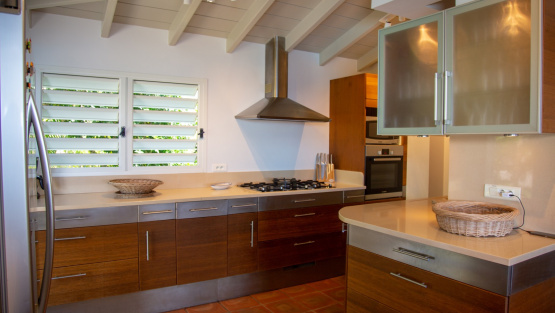 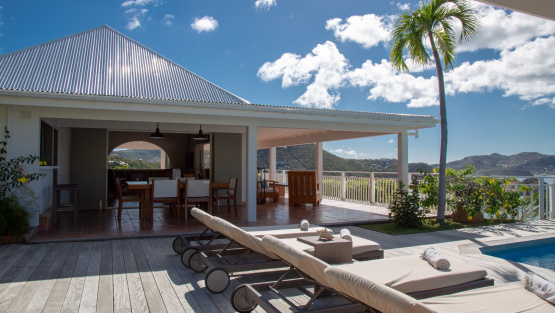 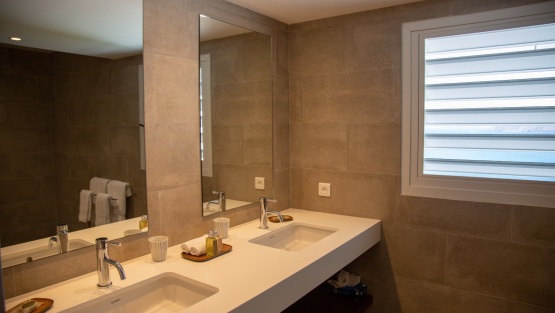 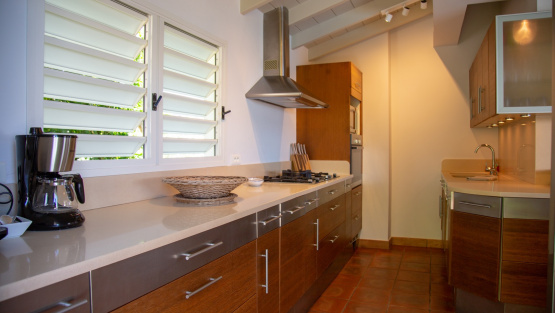 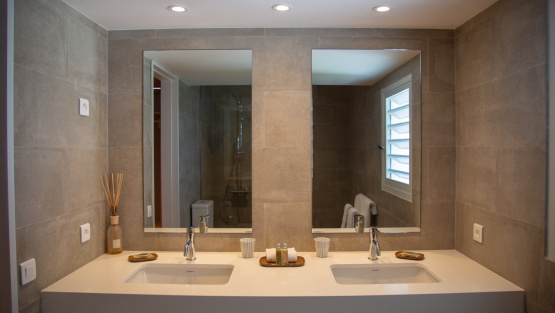 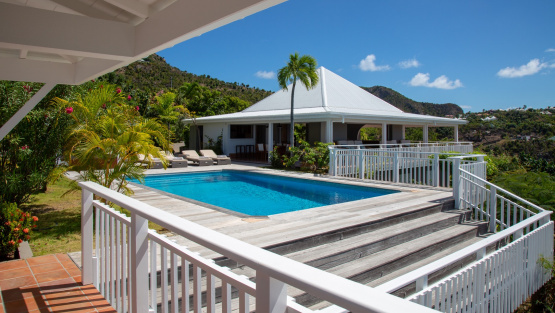 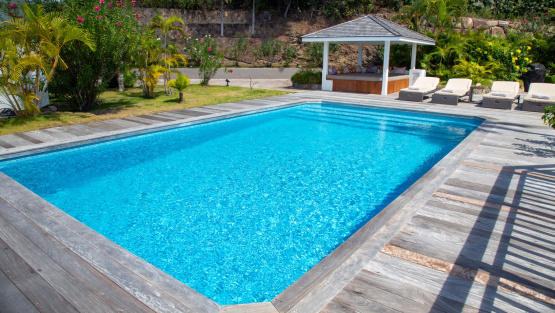 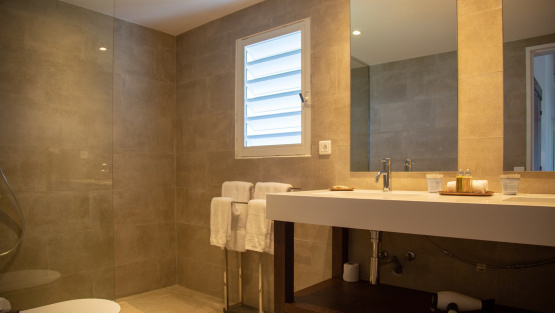 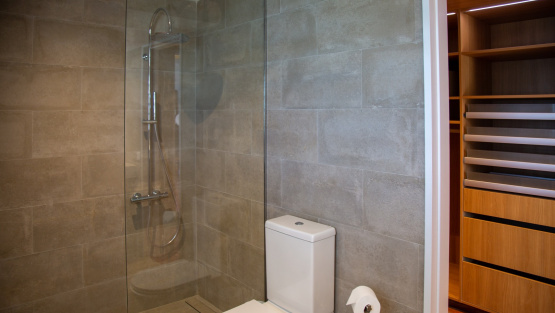 Villa SUCRIER offers a cleaning service six days a week, except on public holidays. 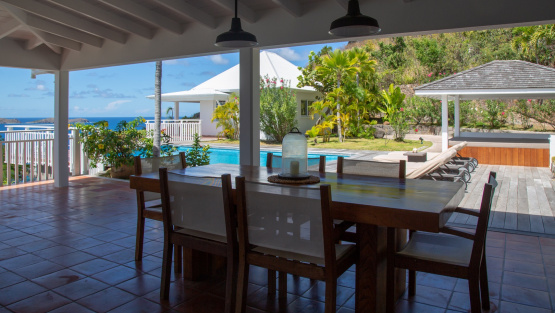 During the Thanksgiving and December holidays, the villa is rented at full occupancy rates, regardless of the number of rooms used. 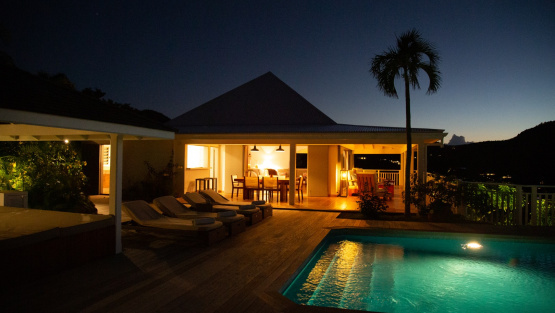 This villa is suitable for young children. 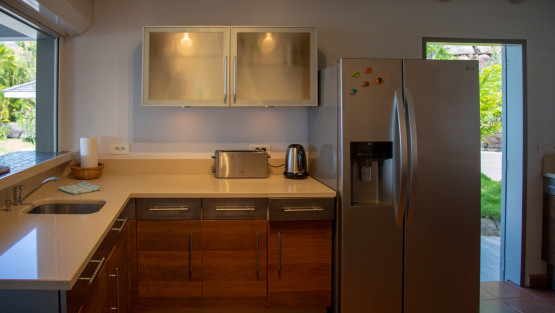 Well-equipped kitchen with Oven, microwave, toaster, espresso machine, coffee maker, juicer, refrigerator, ice machine, separate freezer, dishwasher. 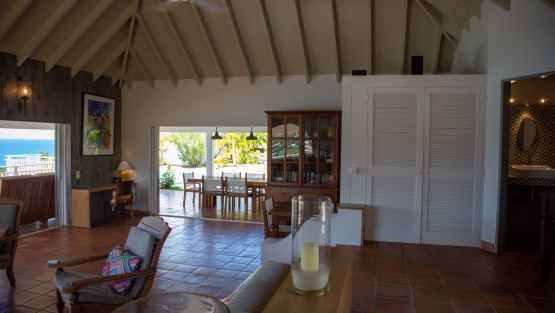 Opens to the dining area and living room. 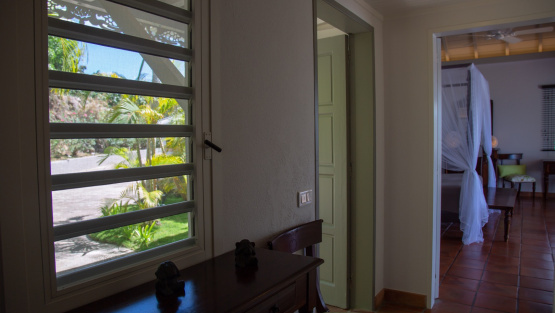 Located in a separate bungalow. 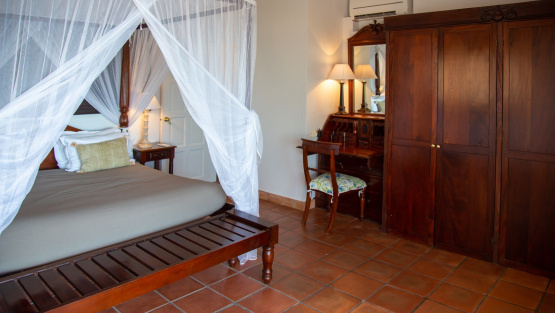 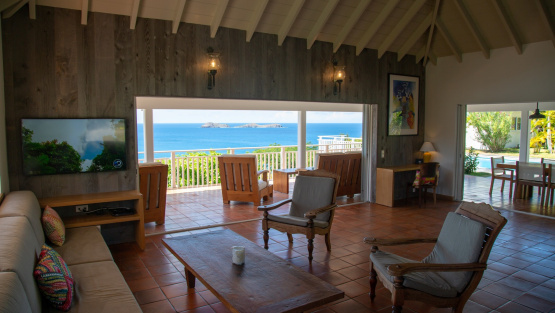 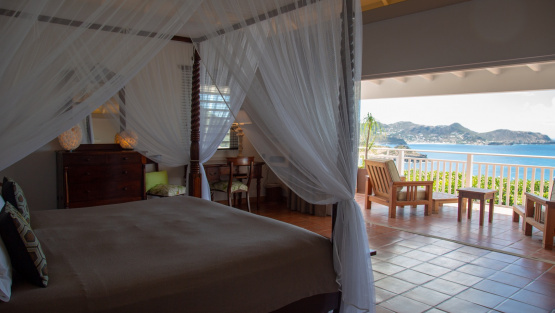 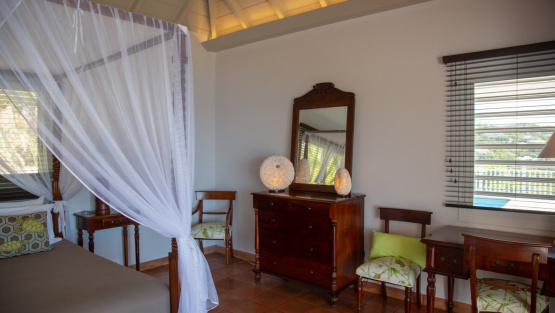 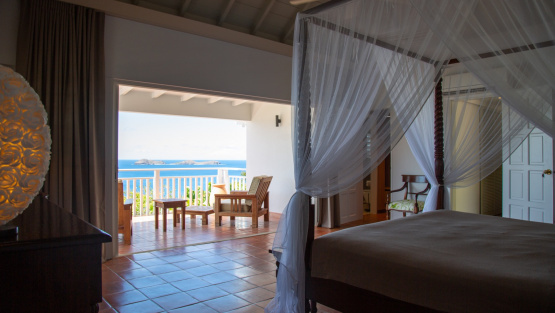 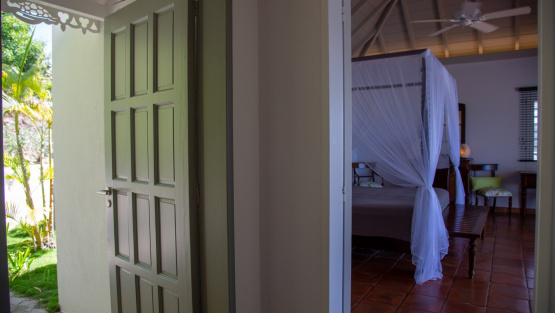 King-size bed , A/C, ceiling fan, iPod connection, phone, programmable safe, dressing room, ensuite bathroom, mosquito net, private terrace, iron, ironing board, hair dryer, ocean views. 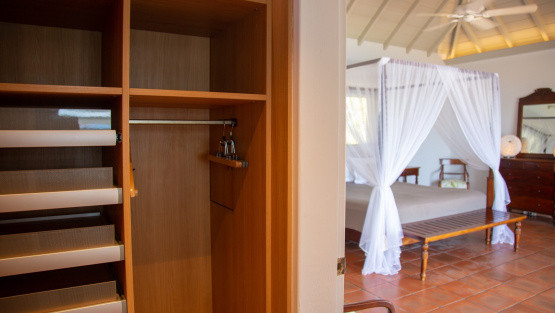 Located in a separate bungalow. 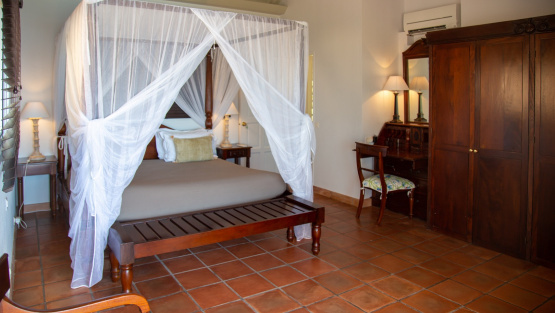 King-size bed, A/C , ceiling fan, iPod connection, phone, key safe, ensuite bathroom, mosquito net, private terrace, iron, hair dryer. 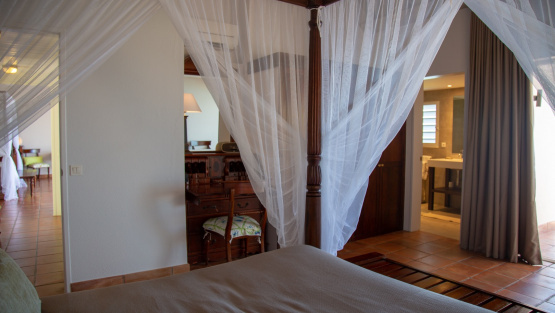 Located next to Bedroom 1. 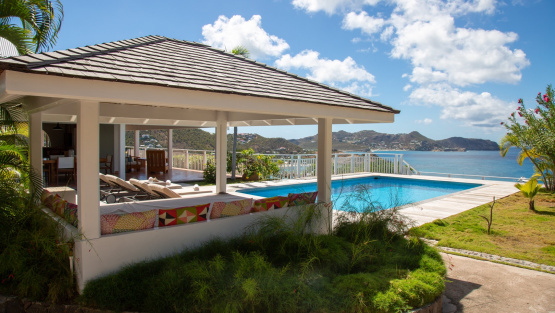 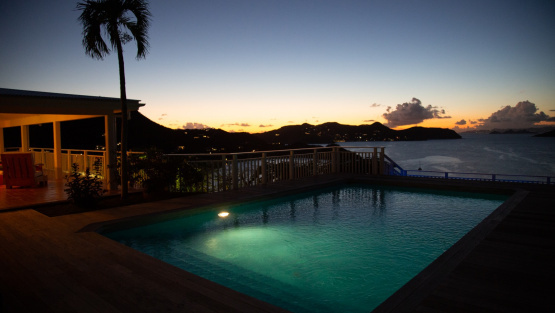 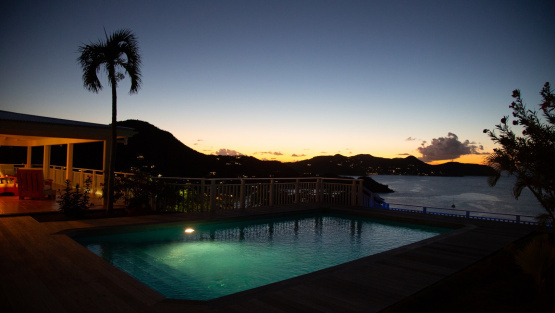 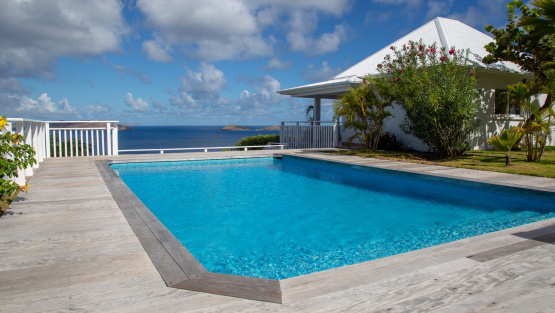 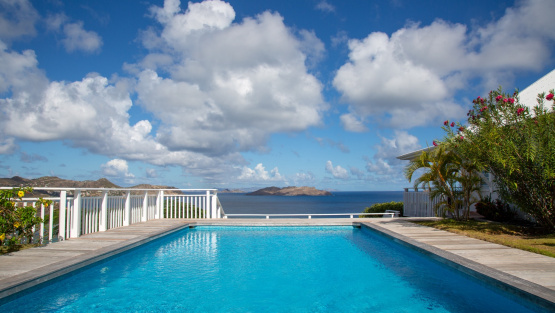 A large deck surrounds the pool, steps into pool, outdoor shower, sun deck, WiFi, magnificient ocean views. 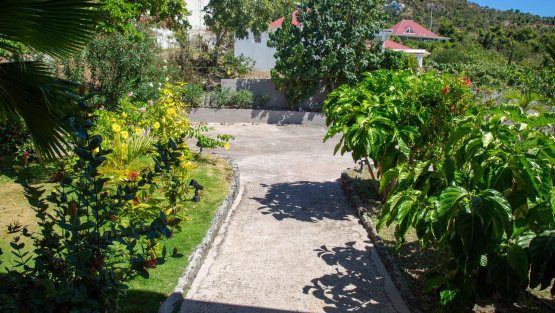 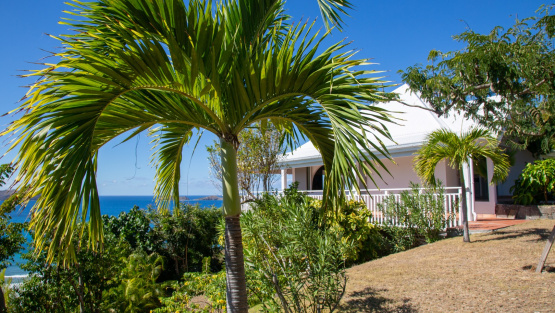 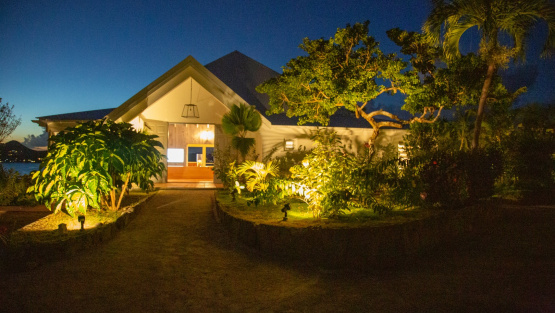 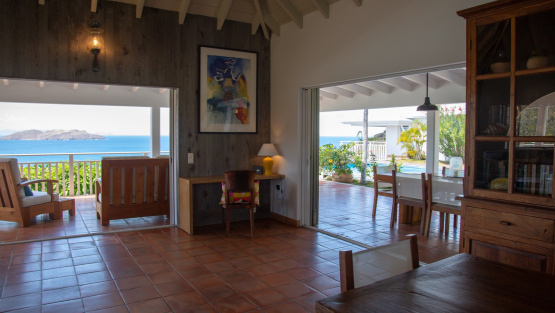 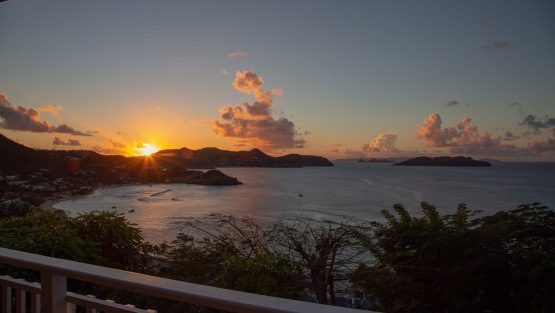 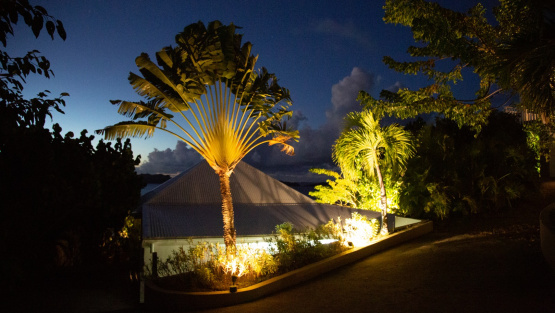 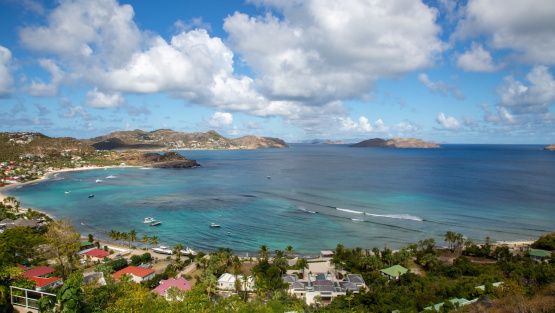 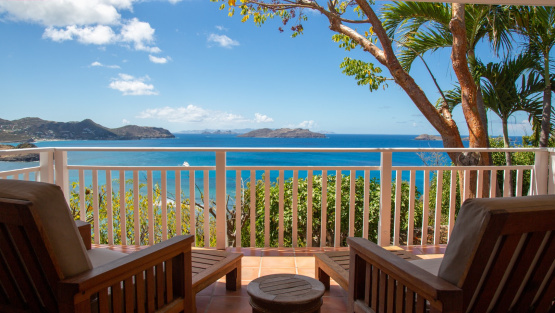 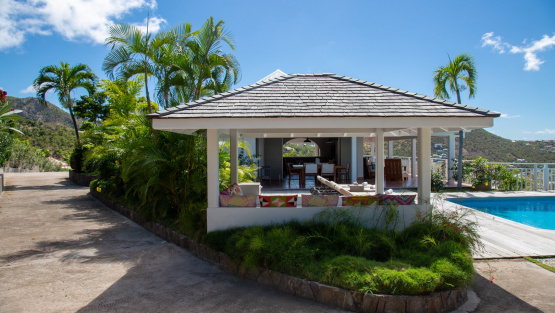 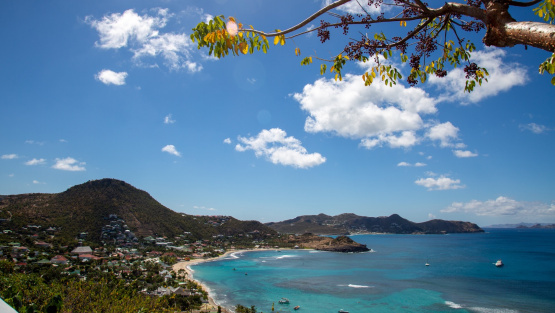 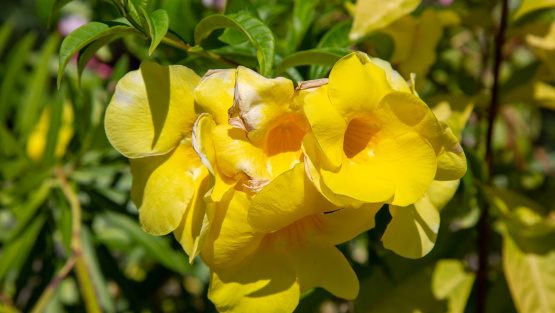 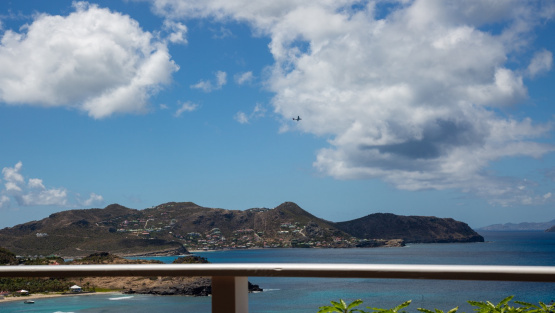 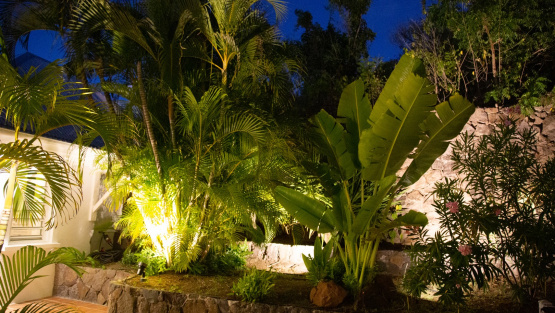 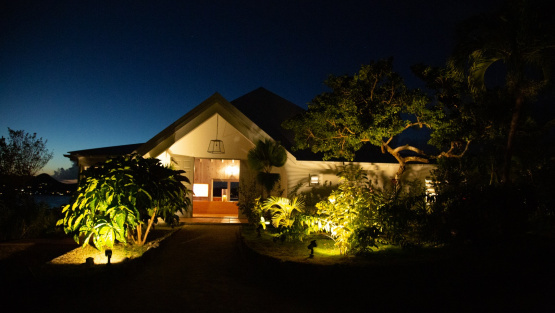 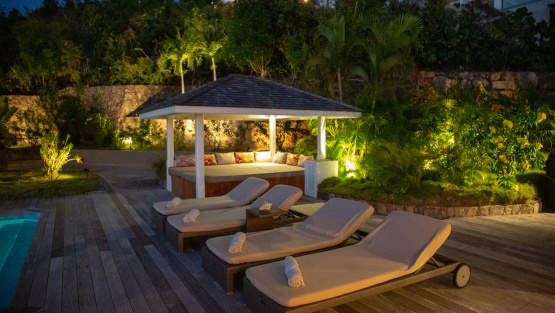 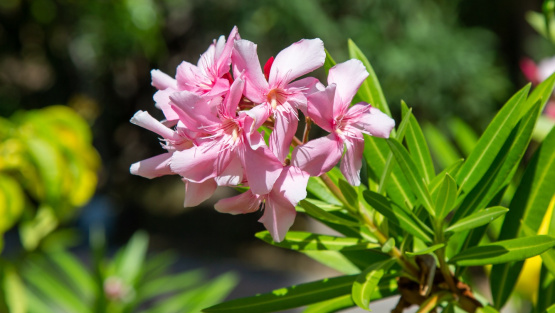 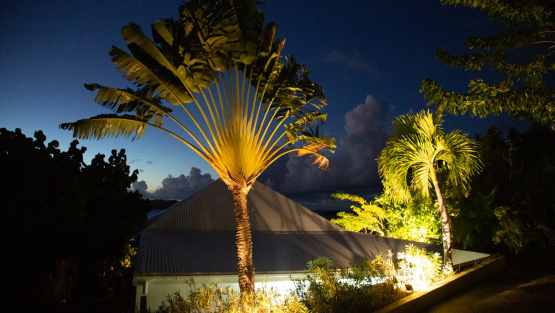 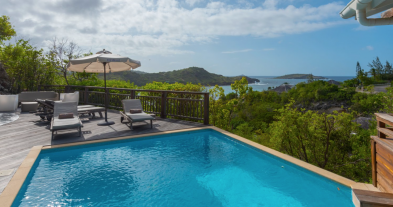 Garden of hibiscus, cactus, and flambouyant trees and dramatic ocean views from every parts of the property.